10-foot waterfall with grotto for behind-the-falls viewing. When Aquascape, Inc. started to outgrow its first home in the garage of Founder and CEO, Greg Wittstock, he envisioned a workplace utopia that would one day house his burgeoning company and its employees. A big part of the “workplace utopia” vision included what was to become Aquascape’s signature pond gracing the façade of Aqualand. Wittstock realized his dream of a workplace utopia in December 2005 when the company finally settled into its new quarters, complete with a silver-level LEED® certification and the largest sloping green roof in North America. The signature pond, however, had to wait a couple years before coming to fruition. Ed Beaulieu, Chief Sustainability Officer for Aquascape, was charged with the design and execution of what was to become the “World’s Most Extreme Pond.” Since many of their customers had been clamoring for advanced, hands-on training sessions, the team decided to offer their customers the chance to lend a hand in building the 250’ x 90’ water feature. 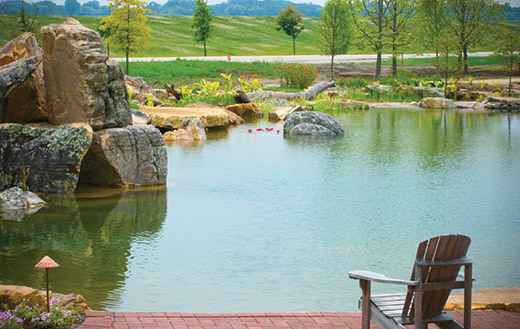 Early in 2008, Aquascape’s Executive Vice President of Business Development, Jeff Payton, suggested that the company host the “World’s Most Extreme Pond Build” that summer for select customers only. The response was electric and plans got underway for this unique pond building event. Since the interior design of Aqualand incorporated bringing the Illinois prairie inside the building, Ed Beaulieu wanted to take that philosophy one step further by recreating the Illinois watershed in the extreme pond’s design. The north end of the pond mimics the craggy bluff topography of Jo Daviess County, where the Galena, Illinois home of Ulysses S. Grant resides. The ancient glaciers didn’t quite reach the northwest corner of Illinois and the area is now a popular vacation spot with magnificent scenery bordering the Mississippi River. Limestone and sandstone mixture, along with some rocks from Galena were procured for this area of the pond. Because Greg Wittstock is dedicated to having fun at work, he and Beaulieu agreed that this craggy area would be the perfect spot to place a jump rock for those brave enough to plunge into the depths of the pond. Careful consideration and placement ensured a natural-looking platform for a little fun and entertainment. 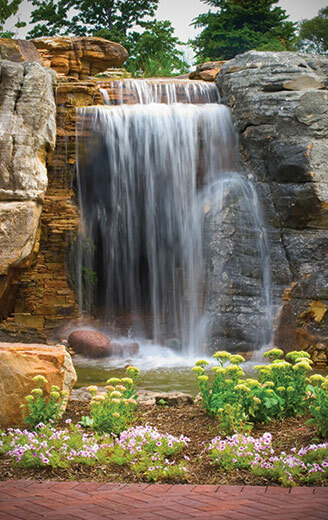 Nestled in the midst of this area’s 10-foot berm, staggered with limestone to represent Northern Illinois, is a waterfall grotto. Beaulieu’s goal with the grotto was to incorporate Karst topography, which is a landscape created by groundwater dissolving sedimentary rock. Land forms such as tunnels and caves are typical in this type of topography. Water seeps into and through these land forms, and the Extreme Pond’s grotto is no exception. The team working on the grotto made sure that water would drip into the cavernous hollow, creating as natural an effect as possible. A small path through a limestone ravine leads to the interior of the grotto where onlookers can enjoy a behind-the-falls view. Dangling roots and accent lighting enhance the cavernous experience. The grotto began as a large cement block that was set into place before the crowds arrived to help with the World’s Most Extreme Pond Build. The interior was faced with a mixture of sandstone and limestone, broken into small pieces and placed strategically, much like a mosaic. Moss, roots, and dripping water piped in from the stream above provide an authentic ambience. Just south of the grotto where the water meets land’s edge is a 12 to 15 foot rock slab that juts out over the water. In the future, a gazebo will be constructed near this spot for optimal viewing from the east side of the pond, which is farthest from the building. 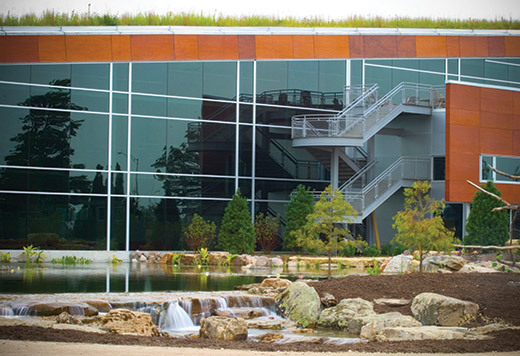 The newly constructed “extreme pond” graces the facade of Aquascape’s LEED certified company headquarters. Moving toward the center section, the pond reflects the flat marshy terrain of central Illinois’ farmland. Slow moving water and deep pools with lush vegetation were incorporated into this area of the design. It’s here that Beaulieu added the deepest part of the water at 10 feet, allowing a fish tunnel to be installed so koi would have a place to hide from would-be predators. Toward the southern end of the 250’ long water feature, a variety of aquatic plants were added planted to resemble a painting of Monet’s garden. Over 200 hardy, day-blooming water lilies were planted by numerous contractors led by Steve Stroupe of Davis Creek Marketing Group, Inc. Although it will take a couple years for the plants to mature, several lilies were blooming just weeks after the crowds dissipated. Adjacent to “Monet’s Garden” is the wetlands area. Two of the water feature’s largest coves are located where the wetlands filters reside. Shallow, warmer water conditions allow for optimum plant growth here. Filtration in the wetlands was designed to mimic nature. In nature, groundwater is filtered through several feet and many layers of soil and sand before reaching the aquifers. Aquascape’s signature pond consists of 3 to 5 feet of gravel. The gravel bed provides an ideal home for bare root aquatic plants that absorb nutrients, forcing the plants to grow rapidly. The root zone is biologically active and is responsible for breakdown of organic compounds. Since excess nutrients contribute to algae growth, the plants in the wetlands area of the pond help to control algae and keep water clarity optimal. The wetlands area is approximately 85’ x 10’ and is divided into two bog areas, measuring 35’x10’ and 50’x10’. The underground Centipede™ Module creates a 93% reduction in water velocity. Water moving through natural wetlands has a slow speed, and Beaulieu wanted to ensure that same lazy attitude. The pond contains a vanishing edge near this location. From inside the building, a blur line occurs where the water ends and land begins, creating a stunning view. At the very southern end of the pond, a cypress swamp was incorporated into the design. Bald cypress trees were planted to mimic Southern Illinois’ vegetation and large logs were placed for visual interest. The logs were previously excavated from the property and saved to be used specifically for Aquascape’s extreme pond. Nearby, the pump basin holds up to 40,000 gallons of water and houses all of the filters, jets, and pumps for the waterfalls. From here, the water is pumped back to the northern edge of the water feature where the greatest volume of circulation exists from a set of waterfalls. Aquascape’s signature pond is bisected by a large grassy peninsula at the eastern edge, which makes way to flat limestone slabs that act as stepping stones toward the building. Eight thousand gallons of water per hour flow over the stepping stones. The water is approximately 3 to 4 inches deep over one of the stones. The rest are located above water for easy stepping. Transitioning from the stepping stones to the building is a series of man-made deck “stepping stones” created from recycled plastic. Interactive areas were incorporated throughout the water feature and the peninsula is a key area to spend time enjoying the surrounding watery views. The patio adjacent to the grotto’s waterfalls is another favorite viewing area due to the captivating views and availability of lounging areas. Viewing areas of the pond from inside the building were given careful consideration as well. Upon entering, the water comes right up to the glass walls of Aqualand. Blue carpeting repeats the wave pattern giving the illusion of the water flowing into the building. The company’s main conference room appears perched atop the water and sliding doors from the room give full access to the water feature and its stepping stones. Next to the pooling water below the waterfalls is a pervious patio that contains a 3,000 gallon underground rainwater harvesting system, complete with stone bubbler above ground for additional visual interest and aeration of the stored rainwater. A project of such magnitude needed the help of a few friends and approximately 600 people from 250 companies were in attendance for the World’s Most Extreme Pond Build from July 12th to 16th. Select customers, employees, and even vendors got their hands dirty during the highly energetic week of rock maneuverings, shoveling and digging, water-filling, water lily planting, and even some good old mud-slinging. Several weeks before the crowds descended, Ed Beaulieu arranged for the excavation of the 250’ x 90’ water feature. Employees assisted as needed, especially when underlayment and 36-milliliter reinforced polypropylene liner needed to be spread across the massive feature. The pond’s bottom has a series of shelves transitioning to the very bottom providing necessary structural stability. In addition, the pond shelves lend a more natural appearance and provide a place for plants while also acting as safety ledges. Over 1,400 tons of boulders were delivered over the course of several days from Semco Outdoor of Belton, MO, with a few rocks topping out at 50,000 pounds. Many of the larger boulders were hand-selected by Beaulieu and Wittstock. The pond shelves are lined with granite boulder. Granite doesn’t leach minerals into the water like limestone, so the limestone was saved for stepping stones and other areas above water. In addition, granite is smooth and won’t place as much wear and tear on the liner. They’re quicker to set in place and a range of sizes were specified to make the water feature appear as though Mother Nature herself created it. The 250’ x 90’ “extreme pond” has numerous vantage points from which to relax and enjoy the view. 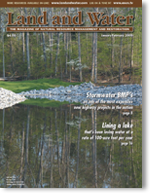 Five hundred tons of river rocks ranging from pea gravel size to 3’’ diameter were spread across flat areas of the pond to completely cover the liner since liner exposed to sunlight can become damaged over the years. Rock also provides surface areas for beneficial bacteria to attach, thereby enhancing the sustainability of an ecosystem pond. Sandstone juts out across the water’s edge to lend an eroded look, while moss and lichen cling to other boulders for weathered appeal. Rock placement during the Extreme Pond Build provided unique challenges. “Most rocks look good on one or two sides,” claims Beaulieu. “There are really only one or two ways to set a rock. It took several hours to place the largest boulder gracing the entrance to the grotto, but you have to respect Mother Nature and get it just right so it looks natural.” Nature has a certain order to it and contractors were careful to make sure the rocks didn’t look too haphazard as they placed them around the pond and throughout the waterfall berm. Ornamental shrubs and evergreens completed the look. Ed and his massive crew worked with a total of 17,000 tons of stone, which amounted to 80 truckloads being managed weeks before the big build commenced. Some of the larger rocks reached heights of 10 to 12 feet. The procession of rock and stone took careful and precise organization and staging, along with the delivery of 10 truckloads of soil, 200 truckloads of fill, and 150 yards of mulch. The largest boulders were placed using excavators. Custom-made nylon lifting slings were carefully wrapped around each one and used to lift and lower the rock into place. Three of the largest boulders took approximately 4 hours each to place, with a guiding group of 5 to 6 contractors. Safety crews were on hand to watch traffic flow of the excavators, trucks, forklifts, and human resources. Workers moved quickly and smartly and there were no major injuries or accidents during the amazing construction of the World’s Most Extreme Pond. Once the pond was rocked in the crew began filling the pond with water. Many workers stayed late into the evenings to help complete the project on time. On the final day of construction, attendees were called to the patio area to witness the turning on of the waterfalls. A crowd of hundreds waited in hopeful anticipation. As the falls crashed over the edges of rocks and stones, cheers arose from the crowd and high-fives ricocheted through the sea of humanity. After days of dusty work, contractors began plunging into the cool pool that had become the World’s Most Extreme Pond. The jump rock at the northern edge suddenly become the center of attention with young and old alike celebrating the culmination of something truly special by propelling off the rock into the waters below. In addition to the construction of the pond itself, contractors were also able to attend hands-on training sessions to learn how to install putting greens, permeable pavers, landscape lighting, drip irrigation, and a stone fire pit. In addition to the construction of the pond itself, contractors were also able to attend hands-on training sessions to learn how to install putting greens, permeable pavers, landscape lighting, drip irrigation, and a stone fire pit. Indoor class sessions for those needing a construction break were available and covered a range of topics from business management to rainwater harvesting. Construction materials totaling over $200,000 were donated to the event by various vendors. The 5-day event closed with a group dinner where awards were distributed and keynote speaker Brad Barton addressed the audience. Greg Wittstock closed the event by thanking Ed Beaulieu for his vision and artistry in creating the design. Greg also thanked the attendees for their hearty contributions and noted that each of them would have a brick with their name embedded near the pond’s edge. Beaulieu plans to have the property certified as a Wildlife Habitat by the National Wildlife Federation. The World’s Most Extreme Pond is currently open for public viewing. For more information, contact Aquascape, Inc., 901 Aqualand Way, St. Charles, IL 60174, (866)877.6637, www.aquascapeinc.com, emails@aquascapeinc.com.